Thursday May 26 at 8PM, lecture-performance by Toon Fibbe, at Sojourner Truth Neighborhood Center, 2200 Lafitte Street. Toon Fibbe will present his research on the way New Orleans was implicated in the development of our capitalist system. New Orleans was the investment subject of the first stock market bubble (the Mississippi Bubble). This bubble was the subject of a book of Dutch satyrical drawings depicting New Orleans as a city that was found on speculation. 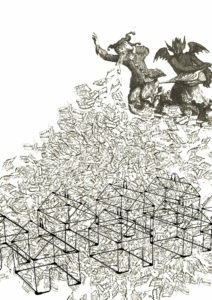 In his work Toon researches the metaphors employed in this book, in which all kinds of unearthly creatures spur economic activity in relation to the wave of privatization that happened post-Katrina and the development of mixed income housing.